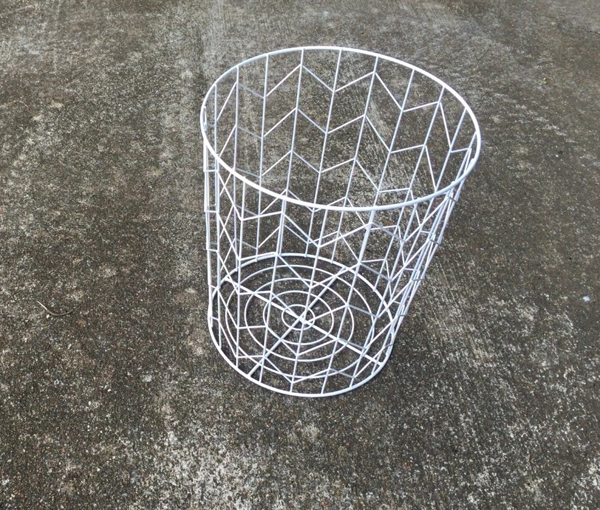 I picked up this basket at a yard sale for $3 – I’m not sure if it was supposed to be a trash can or a laundry hamper… but in my hands it became a side table. 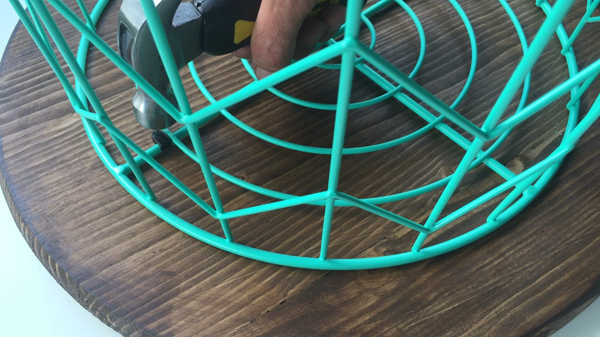 First I gave the basket a couple of coats of Krylon® COLORMAXX™ in Sea Glass. While it was drying I started on the top. 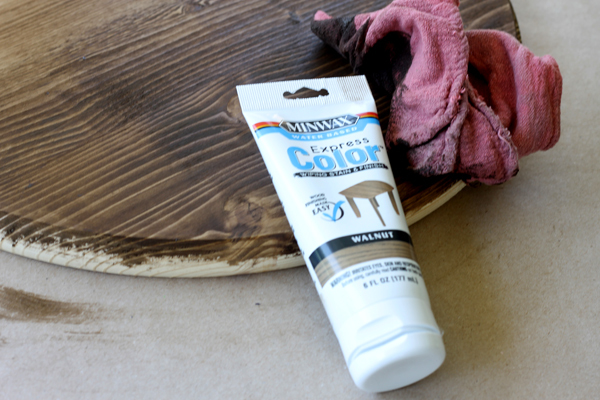 Using an 18 inch round wood panel, I stained it with Minwax® Express Color in Walnut – I love this stuff because it’s easy to clean up if you make a mess. After it dried a few hours, I sealed it with Minwax® Polyacrylic clear coat. After both the top and the basket were dry, I used cable staples to attach the basket to the top. With just a few taps, we put one on each of the cross pieces to make it nice and secure. Flip it over and you have a side table! We use this table on our front porch, so I know its a great idea for outdoor use (as long as the top is sealed properly). It would also be great for a night stand or end table, too! 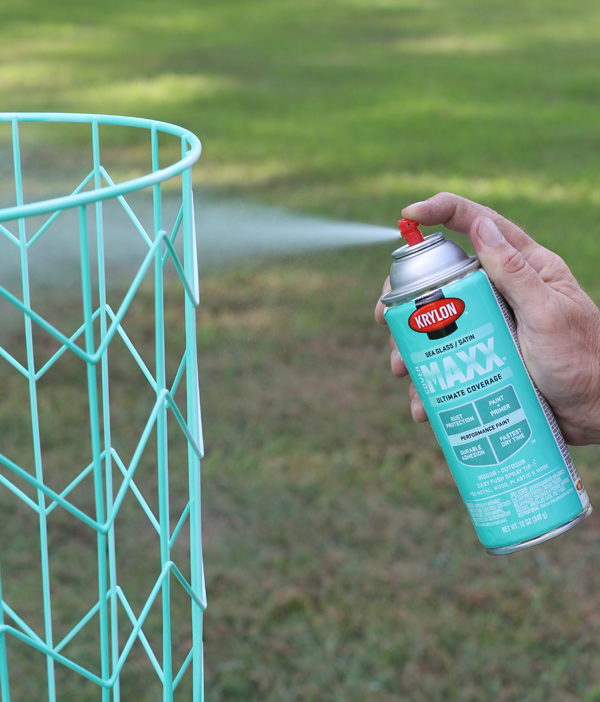 So then next time you come across a wire basket at a yard sale, don’t pass it by – turn it into this easy DIY side table. Great idea! I just picked up two very similar baskets. I am absolutely in LOVE with this d-i-y tutorial, Gina you did an outstanding job! The basket for the table has such an amazing design I wish I could find this same one. (: But I cannot wait to recreate my own soon, thanks for such a great post. I’ll be looking forward to you future tutorials! Love this idea! I have been looking for something like this and found one for $150! Thanks for sharing! I am looking forward to making this! What is the height of the basket? Hi! I’m wondering how much your top was and where you got the wood? Love this! 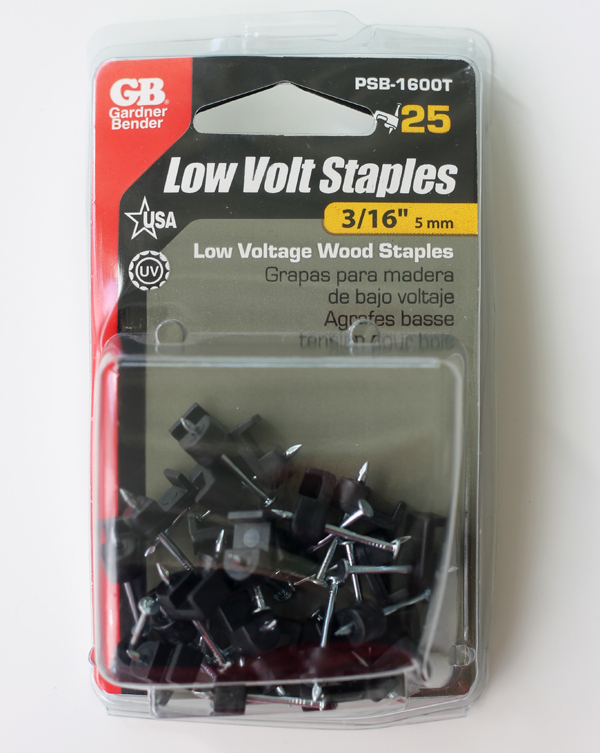 Hi Gini, I got the wood top at Michaels I think, it wasn’t much but I don’t remember exactly…a few dollars? Love it! I envy anyone who can thing outside the box! Thanks for sharing! I was wondering if I could share your story and 2 of the photos on 1-800-GOT-JUNK?’s instagram account? 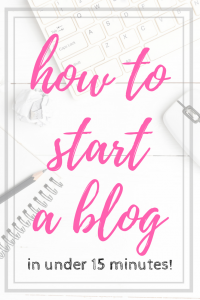 We love your content and we will tag you in the photo as well as give you credit. Love this idea! How tall is your basket??? Thanks Jordan, the basket/laundry basket…whatever it was supposed to be, LOL, is about 36 inches tall. 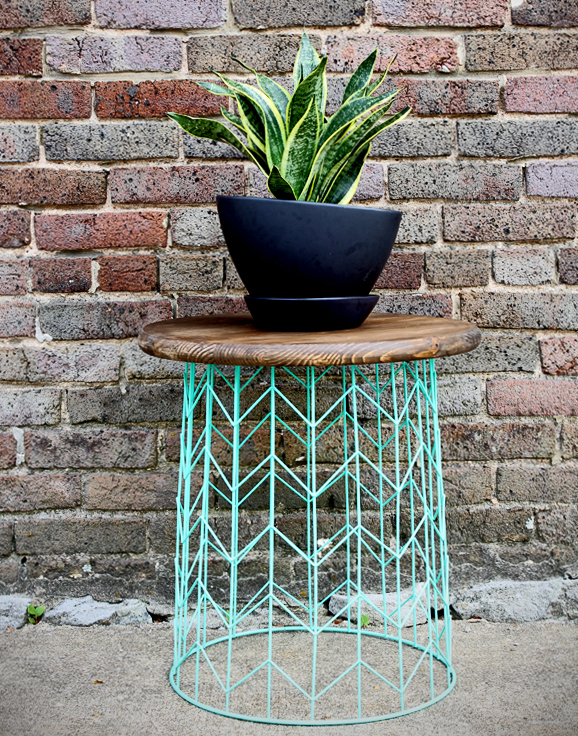 Makes for a fun and easy side table! Nice project. Walnut seems prety well. Thank you, it was a fun project and super easy! What a creative idea Gina! It looks fantastic! Love it!!! I’m curious as to how you got a krylon sponsor?? Did you go through a platform to find them or did they find you? How do I follow your projects? 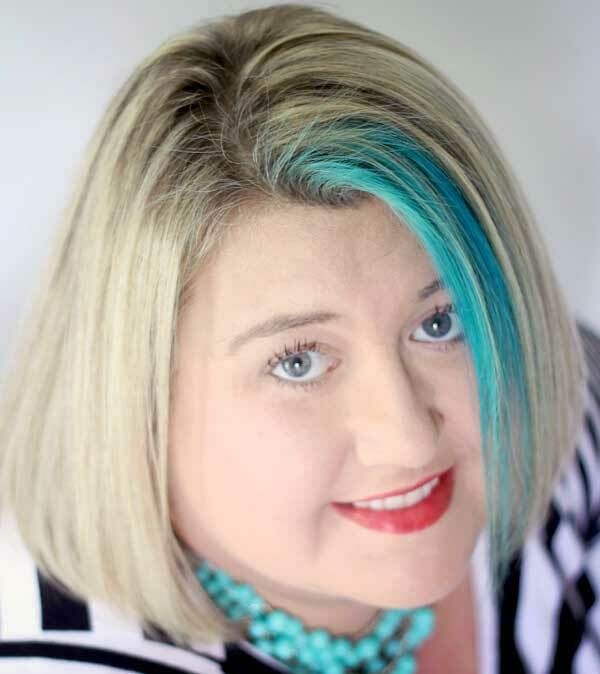 Love your style, and you’re as adorable as your table, with your bold aqua streak! 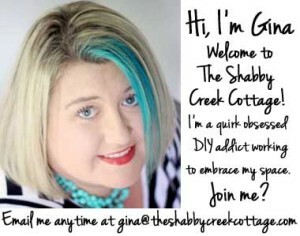 or sign up for my newsletter on my blog site, https://www.theshabbycreekcottage.com/ there is a sign up section right below my newest entries. Thanks so much I am so happy to have you join us! Love your diy projects! You are very talented. Please send more. Thanks for sharing! OH what a great idea and a good way to recycle my I think it is apple basket. It might have tabs for the handle I might have to bend down. I have a small round table top I can use. Very cute. 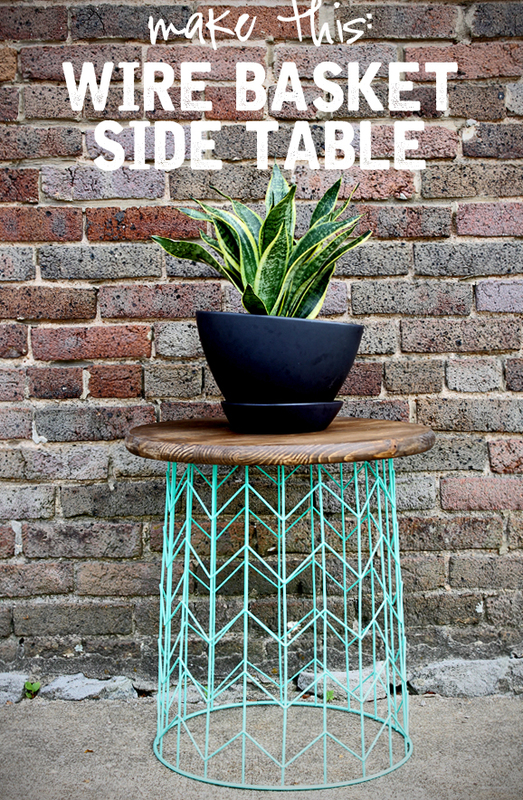 Make a nice patio table or plant stand. LOVE spray paint!! Where did you buy the round top! I’m dying to try this cute DIY! I got it at Michaels, a long time ago though Kayla 🙂 Have fun! !